Yup! The “experts” think it’s good. Of course the “experts’ are not making decisions about hiring, purchasing, borrowing…, ya know, all those things required to run a real business. From that point of view, it’s not good. The headline is 178k, but the private sector only added 156k. The average new hires for the private sector are running well below the 2015 average and below 200k at just 164k per month. At this point our readers know the words to the “Why did the unemployment rate fall?” song. 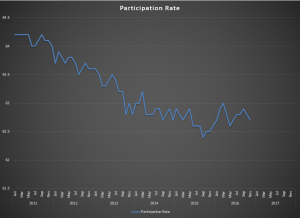 As has been the case for over seven years, the change in employed has outpaced the change in the labor force, moving the lines closer together to give us an artificially low unemployment rate. 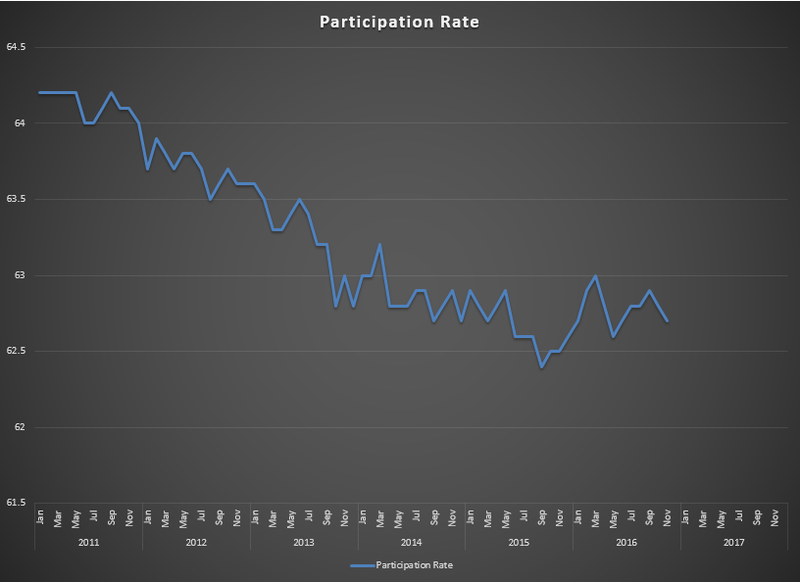 As a matter of fact, the Not In Labor Force total raced above the 95M mark driving the Participation Rate down to 62.7, the third worst reading in six years. That’s the graph this month, back to 2011. Recovery, indeed! Did the analysis seem a bit light (less wonky) this month? Economic data comes to us in three levels of timeliness; quarterly, monthly, and weekly so even the most current information is still lagging. For two administrations now, we too often have ended with the phrase “Policy matters, and these aren’t working.” We have plenty of reason to believe that we are about to see a significant change in policy, and that will render detailed analysis of lagging data largely intellectual for a quarter or so until new policies have had a chance to establish an actual vs. anticipated impact. The Blue World Economic Index®, published yesterday, provides a much broader view of this. This is the last time we will hit the “Publish” button for the jobs report analysis in 2016. We can’t believe it’s another trip ‘round the sun come to an end. As a friend once said “The days are long but the years are short.” God bless you. Merry Christmas. Happy New Year and we’ll see you on the other side. 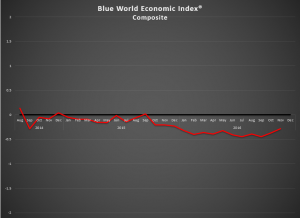 The Blue World Economic Index® showed material improvement for the November 2016 report while still landing solidly in negative territory at -.28. Yes, much of the reporting posted after the election, but we need to remember that most of the data was actually collected well in advance. The December report will give a much clearer picture of whether the economy is following the public markets, whose momentum will be closely watched. The weekly data, however, was more indicative of post-election reaction particularly in the Consumer category, via the Bloomberg Consumer Comfort report, whose northerly movement in the second two thirds of the month was unmistakable, yielding an average of 42.2 in October and 45 for November. While the markets made their moves, the data suggests it was more on the backs of retail traders (TD Ameritrade IMX), as institutional investors (State Street Investor Confidence) were more cautiously contemplating the combined implications of Brexit, POTUS, and further EU escape rumblings in places like Germany and Italy. Of the eight major categories, six were still negative, but there was notable improvement in five including Consumer, Employment, General, Retail, and Manufacturing which included a bump to the Fed sub-group. We end most of our reports by pointing out that policy matters…and these aren’t working. We firmly believe there is no sin in being wrong. The sin is committed when we refuse to recognize we were wrong and fail to change policy in response. We think it is safe to say…we’re about to get a look at the effects of some VERY different policy!